PHOTO PROVIDED A collaborative sculptural installation by Bethany Krull and Jesse Walp. Krull and Walp’s show, “Bound,” will be on view at Gallery r as part of The New Rochester Biennial. Wednesday through Sunday, 12 p.m. to 5 p.m.; Fridays until 9 p.m.
Tuesday through Friday, 12 p.m. to 5 p.m.; Saturday, 10 a.m. to 4 p.m. The Memorial Art Gallery on six occasions presented the Rochester Biennial, an invitational exhibit that boasted the work of some of the best regional artists. The Biennial brand was passed to Rochester Contemporary a couple of years ago, and after some consideration and restructuring of the show, RoCo is sharing the stage. The New Rochester Biennial will kick off in three locations on Friday, October 6. "Our goal is to expand the model," says RoCo Director Bleu Cease. "I want to instigate more meaningful collaboration between mid-sized venues in Rochester, shine a light on thoughtful, challenging work, and instigate new curatorial models." RoCo, Visual Studies Workshop, and Gallery r will each host curated exhibitions through October and November that investigate creative collaboration, influence, and partnership. "Witness," hosted at RoCo, features paintings and drawings by Paul Dodd and Leo Dodd, spotlighting their shared interest in documenting and recording life in Rochester. Paul's work is a meditation on the Crime Stoppers imagery, and his late father Leo's images are of scenes of Rochester's growth and progress, Cease says. "Leo's watercolors are more optimistic and romantic," Cease adds. "One of Paul's portraits may seem neutral and somewhat cool, yet the 'Model for Crime Faces' project grows out of his deep commitment to honoring the human" behind the crime, mugshot, or tragedy. There's a tangible reason behind this empathy, Cease says — Paul's brother was arrested for minor marijuana possession and jailed at a young age. "It had a major impact on their family, of course," he says. "Paul later worked for the police department handling mugshots and crime sketches, further fascinating him with the portrait and how we image criminality." The Dodds' work will be accompanied by archival materials, including a letter written by Leo to his imprisoned son. Gallery r will present "Bound," an exhibition of works by Bethany Krull and Jesse Walp, RIT School of Art and American Crafts alums and a married couple. 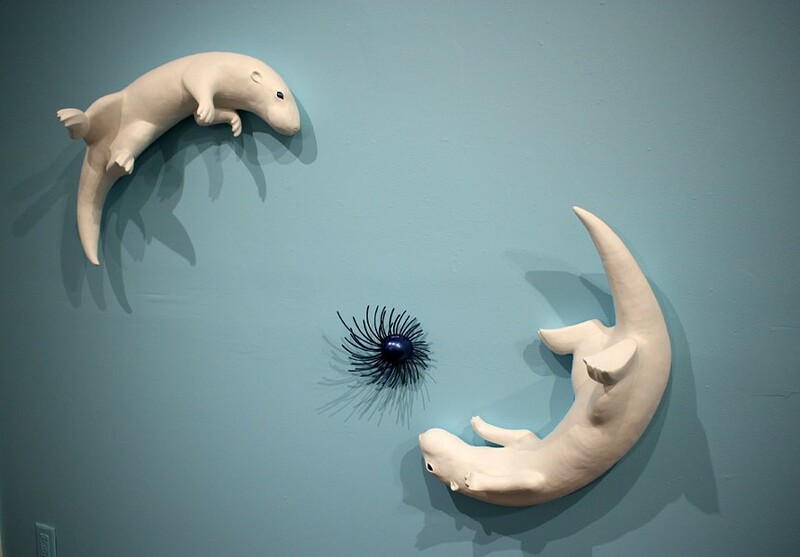 The show will include solo and collaborative work that Krull and Walp have created in the last decade, including installations that reimagine natural environments using ceramics, wood, and installation. Krull's work has always cast a sensitive gaze on environmental matters and pondered the complex relationships humans have with domesticated animals. Since Krull and Walp became parents, the work has taken an even more personal turn. "The influence of motherhood has made its mark on my work" in explorations of beauty, vulnerability, and fragility, Krull says in a statement on her website. "The hungry baby bird, and the furless and helpless newborn mouse perfectly embody this season of my life, where nurturing and protection are paramount," she says. "Concerns about the morality of our politics, the health of our environment, and our own species' ultimate survival are amplified when they are seen as a reflection in the eyes of our children." Visual Studies Workshop will host "Implement," the latest participatory art project by Bridget Elmer and Emily Larned, co-founders of Impractical Labor in Service of the Speculative Arts. ILSSA has functioned since 2008 as an "evolving publishing and public practice platform committed to investigating labor, time, and what we value," the artists say in a provided statement. It's also a research institute and a union that promotes solidarity and creates opportunities for its members, they say. "Implement" will invite participants to share what they consider to be essential tools for living. Also on site at VSW will be an exhibit of selected ILSSA publications and a collection of resources that spotlight the artists who inspired founding and development of ILSSA. The New Rochester Biennial's curators have synched their programming through connected opening receptions, and performances will take place between the spaces organized by Joe Tunis of Carbon Records and performance art group The Bloody Noes, Cease says. A series of staggered opening receptions will be held at the three spaces on Friday, October 6, with a traveling Place Making Processional beginning at 6 p.m. at Gallery r, departing to VSW at 6:45 p.m., and heading over to RoCo at 8 p.m. And there is a day of Progressive Artist Talks on Saturday, October 7, at RoCo (12 p.m. to 1:30 p.m.), VSW (2 p.m. to 3:30 p.m.), and Gallery r (4 p.m. to 5:30 p.m.). Cease says he hopes that this year's tri-venue experiment lays the groundwork for the future, with regards to further connections and collaborative programs, and an expanded audience for participating artists and venues.